David is very keen to talk guitars. You can expect a prompt reply within 24 hours. Benavides Guitars are built with four principles of equal importance: beauty, tone, playability and longevity. 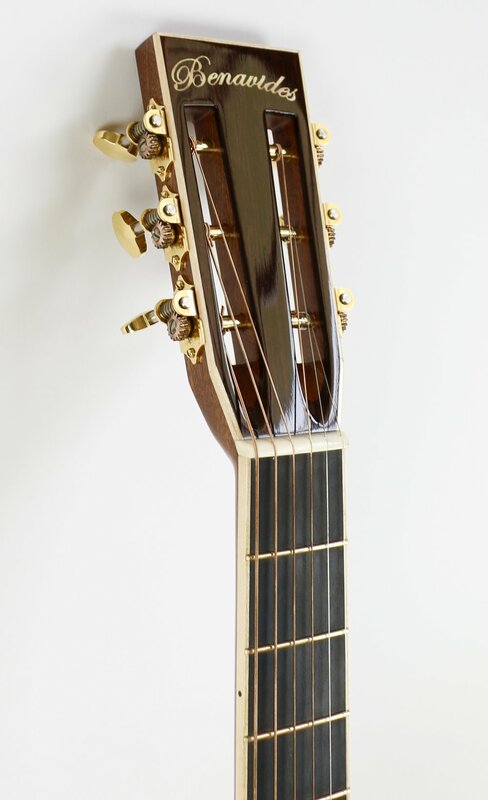 A hand fitted dovetail neck join, compound radius fretboard, tap-tuned tone bars, hot hide glued top braces, and the finest quarter-sawn timbers in the world are a few components of what will make your customized Benavides Guitar sound gorgeous. The 00-13 is what it's name suggests; a 00 size body with a 13 fret body to neck joint. Expect an ambient and open sounding guitar and even more so if you choose to go with the deep body. I make this model in both solid and slotted headstocks, standard (84 - 112 mm) and deep bodied (90 - 118 mm) and in a variety of tone wood combinations.